The proposal for the Windows 7 browser ballot screen is "still pretty fluid" according to Microsoft. Yesterday, Mozilla Foundation Chair Mitchell Baker slammed Microsoft's suggestion of a browser ballot to give users a choice of internet browsers on Windows PCs, despite the fact it seems the design of the screen is not yet set in stone. We asked Laurence Painell, Windows OEM & WGA Marketing Manager at Microsoft UK, for his reaction to Mozilla's accusation. "The proposal was put together and has been placed. The exact details of the proposal have not been released yet, so I would suggest it's probably still pretty fluid," said Painell. "An argument which I would imagine between all the different [developers] – and this has been one of our points all along – who's going to manage it, who's going to pick and how it's ultimately going to be administered. Those fine details have yet to be released." Baker claims the Internet Explorer still has a "unique and uniquely privileged position on Windows installations". Certainly the mock-up shots of the ballot screen we've seen so far (see above) show Internet Explorer on the left, with Mozilla's Firefox, Apple's Safari, Google's Chrome and Opera stretching out towards the right. 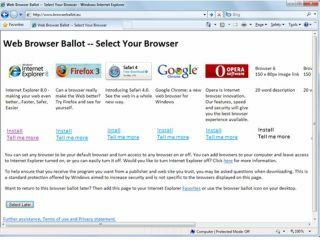 Under the ballot screen proposal, users of XP, Vista and Windows 7 would be presented a screen enabling them to "easily install" competing browsers from the web. The ballot screen will enable Microsoft to ship Windows 7 in Europe with the same functionality as in the rest of the world. Check out our guide to upgrading to Windows 7.